I always get the feeling that behind these elegant, noble women there’s something sinister. 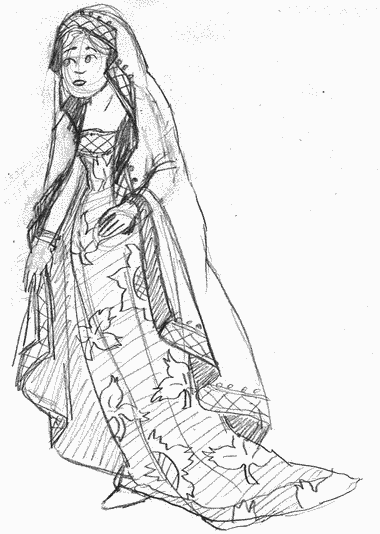 Each time I draw a lady in elaborate garb I just can’t help but add a little dash of “uh oh”. Almost without my knowing, a dash of red bleeds through the embroidered skirt or in this case, sharp claws peak out from velvet cuffs. Almost as if a woman who is this meticulously put together would eat you alive without getting a single spot on her gown. Costume taken from “The Mode in Costume” by R. Turner Wilcox, the first Garment. New York Charles Scribner’s Sons 1944 Copyright 1942 by R. Turner Wilcox.